10:30 p.m. A 5 minute sitting meditation after ingesting a concoction of teas: st. john’s wort, raspberry leaf, oat straw, vervain, and lemon balm. A feel almost nothing. And still a kind of subtle dissipation. Energy in-gathering at the throat then emanating outward. The dance sits and feels. Leaning into the subtlety of almost sensation. Alice is away hunting mice in another home. Thinking about graphemes in the context of signs and signifiers and signifieds. Wondering what kind of graphemes I’ve been generating in this daily practice. Now rounding out the final month of dances. What kind of choreo-graphematic traces are these? Do they have a material referent? Yes. They are full of bodies. And yes, also speeds and slownesses. Are they affective transductions? I hope so. And yet, effective for who? I’ve experimented and found that they are effective in generating in me a range of excitations that help me re-member a moment. Ethno-graphy through graphematic notation. These are little, daily, mundane dances with bodes-lines-and-signs. They are tiny experiments in following through on lines (of flight, etc.). In “recording” (taken here, not as a form of capture, but as an act of being lured in by, and so a practice of getting drawn towards while reaching into) the thickness of senses and qualities. For me they are energy diagrams. 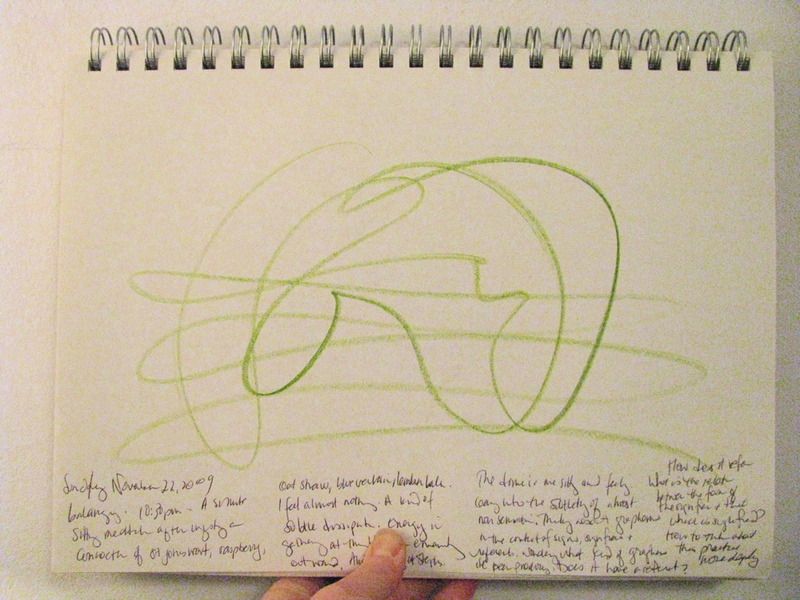 Energetic tracings. Forces and flows and movements and energies. How do they refer? I still don’t quite know. I can intuit that their referents are often ambi-valent. They are also potent conjurings. They seem to script what I will and will not re-member about each dance. They are always incomplete, inadequate, and not quite effective enough at effecting affect; neither in myself, nor in others. What kind of technology/technique/methodology is a graphematic tracing like this for practicing ethnography? This has been an experiment in finding adequate modes to record and relate (at least back to my self) my experience of and participation in movement. Feeling through the movement of drawing. As a first attempt. Making it a daily practice in order to cultivate the dexterities I need in the field in order to relate the fullness of the affects and modes of embodiment that are on the move through the world. ~ by nmyers on November 23, 2009.